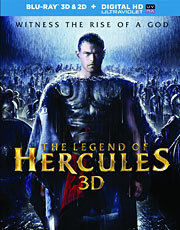 WHAT: When King Amphitryon (Scott Adkins) uncovers the truth about his son, Hercules (Kellan Lutz) – sired by the god Zeus and not himself as originally believed – he sends him off to war in the hopes that he’ll be killed. Instead, Hercules is captured and sold into slavery, where he uses his skills in the arena to win back his freedom and return to Greece to exact revenge. WHY: The first of two Hercules movies to be released this year, Renny Harlin’s brawn-over-brains rendition of the classic tale makes for pretty miserable viewing. Though there’s plenty to criticize about “The Legend of Hercules,” its fate was sealed long before production, when the film’s writers (four to be exact) decided to ignore everything about their hero’s mythological adventures in favor of making a generic sword-and-sandals movie. It’s essentially a mish-mash of every likeminded film that’s preceded it, with a story that hews dangerously close to “Gladiator” and a visual style ripped straight from Zack Snyder’s “300.” The 3D is also pretty annoying, especially when every other scene is blanketed in confetti and pollen. Who knew that Party City was so popular in Ancient Greece? Unfortunately, that’s just the beginning of its problems. From the dreadful acting, to the laughably bad dialogue, to some cheesy special effects (including an animatronic lion that looks like a stuffed toy), “The Legend of Hercules” is reminiscent of those Asylum-produced B-movies designed to cash in on upcoming Hollywood blockbusters, except those films actually know they’re terrible. EXTRAS: The Blu-ray includes an audio commentary with director Renny Harlin and star Kellan Lutz, as well as a making-of featurette. WHAT: Set in a quaint New England town during Labor Day weekend in 1987, reclusive single mother Adele (Kate Winslet) and her young son Henry (Gattlin Griffith) are taken hostage by a fugitive named Frank (Josh Brolin), who plans to hide out in their rundown house until he can make a run for it. But as Adele and Henry get to know their new houseguest, it becomes clear that Frank isn’t the dangerous murderer that he’s been made out to be. 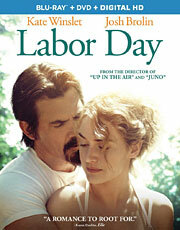 WHY: For a moment, it seemed like Jason Reitman could do no wrong, but even the best filmmakers are capable of making bad movies, and though “Labor Day” isn’t a complete failure, it’s the director’s weakest film by a country mile. Based on the 2009 novel by Joyce Maynard, the movie represents a major departure for Reitman, who’s made a name for himself telling stories with a dark comedic bite. That trademark humor isn’t present in “Labor Day,” instead replaced by gooey sentimentalism that you’d be more likely to find in a Nicholas Sparks adaptation. It’s essentially a trashy romance novel disguised as an Oscar prestige movie – the kind of story that sets back feminism several decades by suggesting that a woman could be this helpless without a strong man around the house to take care of her. Though the first act is fairly good, staged more like a kidnapping thriller than a sappy romance, it eventually devolves into a bunch of melodramatic nonsense. It’s hard to imagine how much worse “Labor Day” might have been without Winslet and Brolin in the lead roles, because their performances are the only thing separating this from your average Lifetime movie of the week. EXTRAS: There’s an audio commentary by writer/director Jason Reitman, a making-of featurette and some deleted scenes. WHAT: Pregnant teenager Agnes “Apple” Bailey (Vanessa Hudgens) leaves her abusive, drug-addicted mother (Rosario Dawson) in order to track down her estranged father (Brendan Fraser). But when she refuses to get rid of the baby at his advice, Apple is taken in by a woman’s shelter dedicated to helping young mothers-to-be. 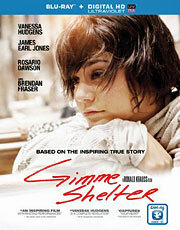 WHY: Based on a composite of several real-life women to come through the doors of the Several Sources Shelters run by Kathy DiFiore (played in the film by Ann Dowd), “Gimme Shelter” had the potential to be much better than this heavy-handed afterschool special. Though it’s great to see Vanessa Hudgens continuing to push herself with challenging roles, her one-note performance (all anger and no nuance) doesn’t change the uncertainty regarding her abilities as an actress. The rest of the cast is wasted in underwritten parts, especially Brendan Fraser as the father looking to make amends, and the aforementioned Dowd, who’s so good in her limited screen time that you wonder why she wasn’t given more to do. In fact, DiFiore’s story is fascinating enough to deserve its own movie, although as my colleague Billy Tatum Jr. suggested in his review, director Ron Kraus would have been better off just shooting the whole thing as a documentary. 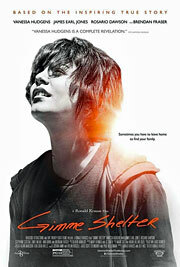 Hollywood has a tendency to neuter these kinds of stories during the production process, and “Gimme Shelter” is one that would have benefited from the authenticity of its real-life subjects. EXTRAS: The Blu-ray includes an audio commentary by writer/director Ron Krauss, a making-of featurette and some deleted scenes. Vanessa Hudgens’ quest to prove to audiences that she’s all grown up takes a strange, dumpster-diving turn in Ron Krauss’ intentionally inspirational “Gimme Shelter,” about a girl’s quest to get off the streets. Hudgens stars as Agnes “Apple” Bailey. Of course, being called Agnes makes her angry, and you wouldn’t like her when she’s angry. She’s a rolling snowball of rage as the film opens, hacking off about nine inches of her long but gnarly hair and setting out to find the person whose name is scrawled on a mysterious envelope. Her journey seems perilous from the start as her drugged-out mom (Rosario Dawson) literally stands in her way. A fistfight ensues before she hops into a waiting cab, from which she’s kicked out of for lack of payment and trying to steal said cab. Who wouldn’t feel sorry for this girl? Apple makes her way to the swanky estate of Tom (Brendan Fraser), who turns out to be the dad she never met. Tom’s new life as a Wall Street mogul, complete with two new kids and attractive French wife, Joanna (Stephanie Szostak), runs counter to Apple’s scavenger mentality, and it’s not long before Joanna demands that Apple leave as quickly as she entered. But Apple lays even more drama on the doorstep when she discovers that she’s pregnant. Tom goes into instant damage control mode, prompting Apple to “turn the page” on this unfortunate incident by getting an abortion. Joanna even offers to hold her hand and take her to the clinic. Once they get there, Joanna drops the handholding offer and leaves her at the clinic, where Apple decides she’s going to turn the page as a mother. After a night on the streets and a frenetic encounter with a pimp that resembles the late Biggie Smalls, Apple ends up in the hospital, complete with a broken leg, a few facial scars and a bit of salvation in the form of Father Frank McCarthy (James Earl Jones). McCarthy refers her to a group home for pregnant teens where she meets girls just as messed up as she is and seem to be fine with it, because they’ve found a place where they fit in. It’s there that Apple’s journey takes on new and tragic turns that will either make you cheer her on or ask for a refund. Over the past few years, January hasn’t been quite as disastrous for new films as its reputation would suggest, but it’s hard to find much to be positive about this time around. Unless you like low budget horror movies (of which there are several to choose from, including the latest “Paranormal Activity”), the January release slate has very little to offer, save for a delayed Christmas blockbuster and failed Oscar bait from the usually reliable Jason Reitman. What: Betrayed by his stepfather, the King, and sold into slavery because of a forbidden love, Hercules must use his formidable powers to fight his way back to his kingdom. Why: The first of two Hercules films being released this year (and most likely the worst of the pair), Renny Harlin’s origin story of the Greek hero looks every bit the cheesy B-movie that you’d expect from the director of “The Covenant” and “Mindhunters.” Kellan Lutz has already proven himself to be a really terrible actor with the “Twilight” films, and not much seems to have changed in that department, but whoever started the rumor linking the actor with America’s favorite media obsession (Miley Cyrus) only weeks before the movie’s release was a brilliant marketing ploy. Unfortunately, no amount of publicity changes the fact that “The Legend of Hercules” promises to be even worse than the recent “Conan the Barbarian” reboot (another January dud), and that’s certainly saying something. 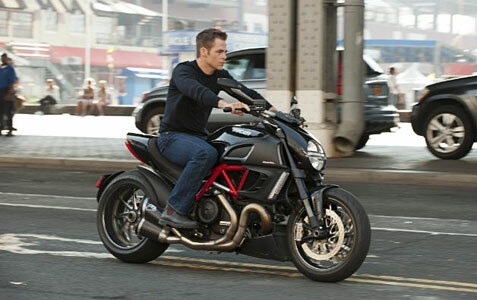 What: Jack Ryan, as a young covert CIA analyst, uncovers a Russian plot to crash the U.S. economy with a terrorist attack. Why: It’s another reboot of a popular movie character, although one that, unlike James Bond and Batman, wasn’t exactly in high demand. Originally scheduled for Christmas before Paramount pushed it back to make room for “The Wolf of Wall Street,” the studio is apparently so unconvinced that moviegoers even know who Jack Ryan is that they had to include his name in the title. While my lack of excitement may be obvious, “Shadow Recruit” does have a few things going for it, including Kenneth Branagh in the director’s chair (as well as playing the Russian baddie), and Keira Knightley and Kevin Costner in supporting roles. I wish the same could be said about Chris Pine, but after already reviving one pop culture icon with Captain Kirk, his casting as Ryan is uninspired to say the least. What: Fast-talking security guard Ben joins his cop brother-in-law James on a 24-hour patrol of Atlanta in order to prove himself worthy of marrying James’ sister. Why: There always seems to be at least one urban comedy released during the doldrums of January, and this year’s lucky winner is the latest movie from Tim Story, which reteams the director with Ice Cube (“Barbershop”) and Kevin Hart (“Think Like a Man”) for what Universal Pictures is no doubt hoping will be the studio’s first hit of 2014. (They have to start recouping that “47 Ronin” budget somewhere). These movies are usually made for pretty cheap and have strong opening weekends, but while “Ride Along” should find success with its target audience, that doesn’t mean it will be any good. The pairing of Ice Cube and rising star Hart is definitely encouraging, but between its paint-by-numbers plot and the surprising lack of laughs in the trailer, you might want to wait for this on Blu-ray.